A few months ago, I wrote three articles on how I built the E-1 Tracer aircraft model. I haven’t built much in the intervening months, but recently I have started on a new project: an MH-53M Pave Low helicopter. This is a somewhat different cup of tea. It’s not a fixed-wing aircraft and I am not starting from scratch. Instead, I am starting with an old model that I built ten years ago. This means that there is a lot less planning involved. The proportions of the old model were pretty much spot-on, but there are many parts and techniques that didn’t exist or weren’t possible ten years ago. As a result, the old model looked, well, old. In this and subsequent articles, I’ll go into how I am building this new version and how newer parts and techniques change how I approach the design. 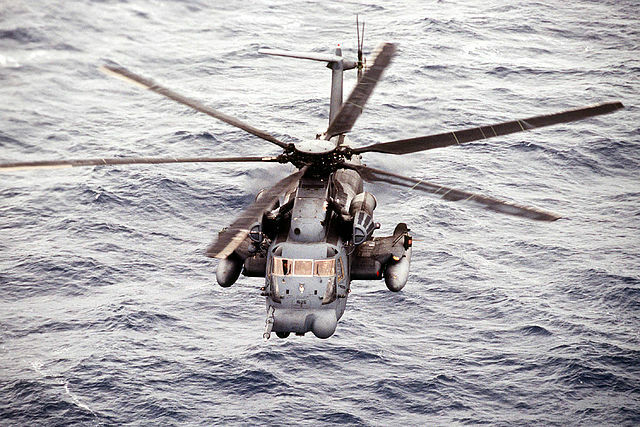 Until their retirement in 2008, Pave Low helicopters were used for rescuing downed aircrew and for special operations. This involved flying far behind enemy lines. The helicopters had a lot of equipment to enable them do this, such as terrain following radar mounted in a thimble-shaped housing at the front, and a wide array of warning and jamming equipment to protect them from enemy air defences. The helicopters could also be refueled in mid-air from Hercules tanker aircraft, using the helicopter’s long nose-mounted probe. These features all add to the machines’ menacing look and made this an attractive choice for a model. 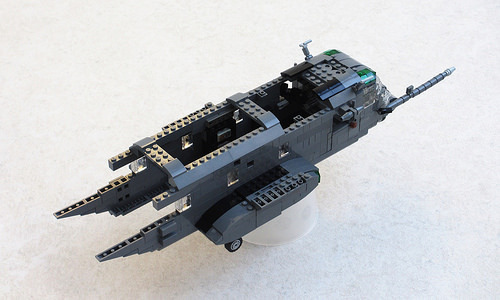 Back in 2008, I built the fuselage as a fairly simple box, with nearly flat bottom and top surfaces. The fuselage corners were slightly rounded using stepped plates. 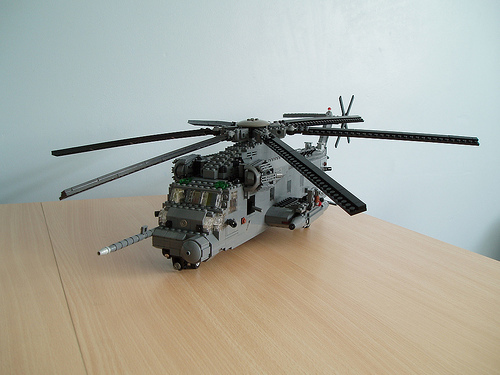 Looking at the real helicopter, however, it is clear that they should be a lot rounder. So, on my new model, I am building the bottom studs-down, with curved slopes forming the bottom corners. Those parts existed back when I built the original, but I certainly didn’t have them in large numbers. I am rounding the top corners using a combination of 45-degree slopes and 1×2 and 2×2 curved slopes. The curved slopes weren’t around ten years ago. The new cockpit section looks a lot better thanks to slightly tapering sides and curved slopes, and cheese slopes give it a much rounder shape. 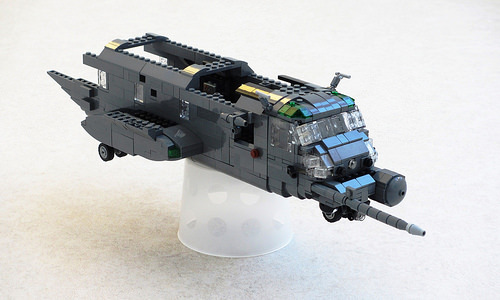 The Pave Low has a retractable undercarriage, with the main units retracting into sponsons on either side of the fuselage. These sponsons have an airfoil shape when seen from the side, which I recreated using curved slopes. I built the pointy aft end using two inverted slopes mounted studs-up and two regular curved slopes mounted inverted. This allowed me to build the trailing edge with 1×2 cheese slopes. It is all much smoother than it was on my old version. There’s an irony in having all of these new parts, though. You might think that they make building aircraft or helicopters a lot easier. However, I find that they actually make it harder, because now that they exist, there really is no excuse for not using them. Getting everything to fit in place, though, means that the model becomes a lot more complicated, with bits pointing in many different directions. A simple box won’t do! My next steps will be building the tapering aft fuselage, the tail boom and then the engines. Watch for part 2 of this ongoing series. I saw your flickr page as well… Wow, the B-1 and F-14 were absolutely amazing! Thank you. Much appreciated. Those two are certainly among my own favourites in the collection, which is helped by the originals being gorgeous aircraft. That’s doesn’t apply to the Pave Low. It’s a big and ugly brute, but an entertaining build nonethless. I half-agree with you about the array of tiny parts that they keep producing…but only half. Yeah, it can sometimes be a pain to figure out how to connect everything together so you don’t just have a loose chunk of parts perched on the rest of the model, but having gone through something similar on a much smaller scale, and having had to put off certain projects until better options became available, I find I have a much easier time doing complex SNOT construction to work in those tiny detail elements than I ever would have had faking it without them. That doesn’t mean it’s always easy, just easier. And the result is usually worth it. My point was that because of new parts, solutions that may have been acceptable ten years ago look antiquated now, but using all of this new stuff to make thing looks look better can still be pretty hard. I’m pretty sure that it took me about ten hours to build the helicopter ten years ago, whereas it’ll probably be closer to 20 hours now. That is not because I got slower, but simply because of the increased complexity. Of course, it is still easier than trying to do something impossible! But that’s exactly what I’m talking about. As you should be fully aware, everyone has a different process. When I design cars, I do it using MLCad because I like to design them from the outside inward. Between a knack for geometry, and a solid working knowledge of the Bricklink parts catalog, I can then fill in the interior with combinations of parts that will hold everything together. It saves me stupid amounts of time tearing apart models, tweaking one little bit, and then trying to rebuild it back to slightly different from what I had before I made the change (and hoping I didn’t forget how to put it back together). And the little detail elements just make the whole process easier for me, which means it usually goes faster. Instead of futzing around with chunky parts where I’m trying different combinations until I find the one that’s as acceptable as it’s ever going to get, there’s a part that gets me exactly what I want with minimal effort. I don’t think we disagree, necessarily, but we’re looking at the same thing from two different perspectives. It’s certainly true that various new elements make some things easier and allow possibilities that didn’t exist before. The 1×1 Technic brick and the 1×1 brick with a stud on its side have added a lot of possibilities that might not have been possible or very hard when there were just old-style headlight bricks. I’m thinking of SNOT lettering, for instance. I’m not complaining about the new parts, mind you. I’m merely making an observation on how changes impacted building the sort of things I do. I don’t use MLCad, as you may know if you have read any of my articles on the E-1. I have a knack for geometry and a parts library in my head, so I usually have a pretty good idea of how I am going to do things before I put parts together. As a result, it is a mostly linear process with little trial and error. The reason why it takes more time now is because various new parts mean I am now adding details and shapes that I simply wouldn’t have bothered with ten years ago, because I knew I couldn’t do them anyway. No, I think our experiences are every bit as different as our design processes. I did try yours once, BTW. I wanted to make the Hitchhiker’s Guide movie shuttlepod, and quickly realized that I’d need to graph out the shape to get a clean spherical look. It was before the cheese wedge existed, I think I subbed MS Paint for the graph paper, and I ended up producing a 14-stud sphere that’s red on the outside, white on the inside, and has room for four seated minifigs plus Marvin standing in the back. I found that the graph paper approach pushed me hard in a studs-up approach to the design. While I was happy enough with the result, the process didn’t really work for me. But I think I have some idea of what you go through. When I disagree that these newer parts make the design process take longer, I mean that rather than taking a week or two to design a car, I may only need a few evenings. What makes the difference for me is that, by designing the outer shell first, it clearly defines the interior space that I have to work with, and where things need to connect to it. I can be just as artistic as I need to be on the part of the design that everyone sees, and then whip out the math hammer on the interior. When they make a part like the 11477 2×1 curved slope, I can use that instead of a combination of cheese wedge, tile, and plate. This can result in a cleaner look, but more importantly it now means I only need to accomodate one stud to attach it where the old solution needed two. That means the interior doesn’t need to be as complex, and designing it takes less time. I wonder whether it’s the design process that causes the difference or whether it’s the sort of things we build. I too build cars and find that building a similar type of car indeed doesn’t really take all that much longer than it used to, but the time I need to build a plane or helicopters has at least doubled. I don’t think I can shave an awful lot of time off that by switching to another way of building them. I might have a diagram, but that’s mainly for the proportions. Those actually save time, because I know exactly how large certain bits should be before I start putting bricks together.